Many people would love their tea or coffee spiced with ginger because of the flavour it adds. It can also be made as a ready mix for all food preparations if properly dried and prepared. Although ginger takes long to mature, you can be sure of a yield at harvest time. Mariam Muggaga, a trader at Gangu Market, says that ginger takes at least eight to 10 months to grow to maturity. “This is almost a full year and during this period, the supply of ginger is low, which pushes the prices up,” she says. At this time, the supply is still low and she buys a kilo of ginger at Shs4,000 from Owino market and re-sells it between Shs6,500 and Shs7,000. She also sells the small portions from Shs500 and above for those who cannot afford buying a kilo. In most cases, Muggaga says that people who plant ginger in February harvest it in December. At this time, the supply is high and the prices are very low where she buys a kilo from Owino market at Shs1,000 and sells it between Shs2,500 and Shs3,000. When the supply is high, he purchases a sack at Shs120,000 and sells each kilo at between Shs3,000 and Shs4,000. To him, the supply of ginger goes down during the dry season and is high when it is the rainy season. “There are two types of ginger, the smaller and the bigger ones. The small ones are best for tea spicing and the big ones are best grown for food spicing, like in pilau (rice),” he says. Meanwhile Agnes Namanda at Bunga Market says that she sells at any quantity because not every person will manage to buy a kilo at Shs8,000. “I sell ginger from Shs500 and above. I realised that if I don’t do that, the ginger might dry up if it stays long and no one will buy it. Here, most people prefer the fresh ones only,” she says. When they start drying up, she is forced to increase the quantities for a particular price to get rid of the stock. 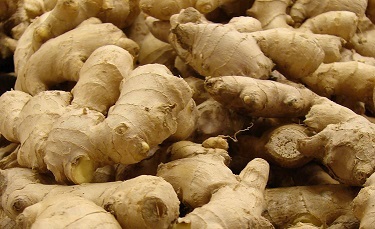 In Uganda, ginger is mostly got from Butambala in Mpigi District.